Le Mariee' : NOT Your Grandma's Eyeliner! Or is it? NOT Your Grandma's Eyeliner! Or is it? I love testing out new products that come out! Anything that claims to be long wearing peeks my curiosity and I am always on the look out for my brides! Another good find! Straight from Estee Lauder, who by the way is such an amazing line! And YES this could possibly be your Grandmother's fav makeup line! Who doesn't know Estee Lauder? I worked behind the counter for the company years ago inside of Dillards and then became one of their free lance artist's I have to say...from experience that, the packaging is beautiful, the products are long wearing, wide shade variety and finding an Estee Lauder counter is pretty easy, since most fine department stores carry the line. 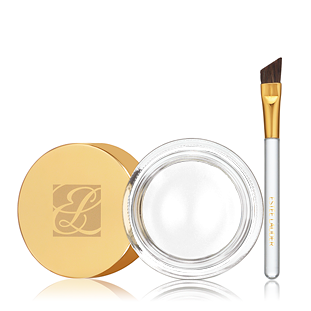 This is the Double Wear Stay In Place gel eye liner, easy to apply, dries in lightning speed time and stays put! 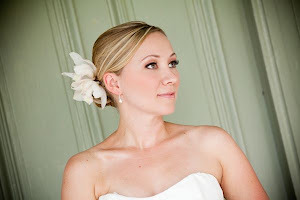 great for long events such as weddings, especially if your in a humid climate! Give it a try.. I did..and I give it 5 out of 5 stars! The pigment is wonderful ..note make sure to smudge or blend right after applying since it drys so fast! I think you will love this! let me know what you think! I tested out the shade "limited Edition" -Violet.. a shade like this is good for a defined look, yet brightens the eye! Bravo to Estee Lauder for keeping up on the latest trends as well!